You’ve probably heard the saying, “Two heads are better than one.” We’ve taken that to heart at Graceland Chiropractic. With two chiropractors on staff, you get the benefit of extra brainpower, especially with difficult cases. Dr. Dean Haldeman graduated from East Knox High School in central Ohio, where he went on to attend classes at The University of Toledo, receiving a Bachelor of Arts in Biology. Upon completion of his undergraduate degree, he continued his education at Palmer College of Chiropractic earning a Doctorate Degree inChiropractic. Dr. Haldeman enjoys playing basketball, golf, water skiing, jet skiing, boating, exercising, snow skiing, traveling, white water rafting, rock climbing, mountain biking, watching OSU football games and being around close friends. 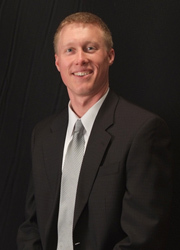 Since graduating from Palmer College of Chiropractic, Dr. Haldeman has practiced chiropractic within the United States for over 6 years and currently holds chiropractic licenses in the states of California and Ohio. Dr. Haldeman practiced his first year of chiropractic in sunny San Diego, California, before returning back to Ohio to practice in Cleveland for his second year. He then established himself permanently within the Columbusarea. As owner and director of Graceland Chiropractic, Dr. Haldeman has seen thousands of patients with a wide variety of health problems. Dr. Haldeman is an active member of the American Chiropractic Association, Ohio State Chiropractic Association, Central Ohio Chiropractic Association and the Ohio Chiropractic Society. He is also the Official Team Chiropractor of the Columbus Comets and Columbus Phantoms Professional Women’s Football Teams. He is responsible for annually treating about 100 professional female athletes throughout their seven month season. Dr. Haldeman believes in educating his patients so that they are able to make informed decisions regarding their health and health related problems. Through his years of practice, he has learned that pain and stress can stop people from living happier, healthier lives. He continually stresses the importance of exercise, nutrition and regular chiropractic care as a natural, drug-free approach in maintaining good health, prevention of disease and returning people to their normal activities of daily living without pain. Dr. Haldeman has been highly successful in treating nervous system disorders such as ear infections, bed wetting, asthma, sinus problems, headaches and allergies with outstanding and long lasting results. Dr. Haldeman is also a structural specialist in regards to neck pain, lower back pain, numbness and tingling into the upper and lower extremities, whiplash and athletic injuries. Dr. Haldeman takes pride in volunteering his time to help educate the public on health and wellness through lectures and workshops. His primary goal is to empower people to live healthier, pain and drug-free lives through education of the chiropractic lifestyle. He has donated numerous hours, by conducting workshops to a variety of local businesses, social clubs, police and fire departments, as well as departments for the City of Columbus and surrounding communities. Dr. Haldeman continually educates himself through annual postgraduate courses and seminars. Throughout this education, he is able to provide his patients with the most advanced rehabilitation techniques and procedures available today. As well as being Board Certified in Chiropractic, Dr. Haldeman also holds advanced degrees in Electrodiagnostic Testing procedures and the Pettibon System to restore and correct the natural curvatures of the human spine preventing nerve interference, irritation and/or damage. Dr. Thomas (T.J.) Corbin is a graduate from National University of Health Sciences, near Chicago, Illinois. His goal is to help people achieve a healthier life by teaching them a natural, drug-free approach to health care. Dr. Corbin graduated from Findlay High School where he was recruited to play soccer for Hiram College as a goalie. Dr. Corbin is currently theOfficial Chiropractic Physician for the Columbus Crew since the 2003 season. While at Hiram College he received a Bachelor of Arts Degree in Finance and Accounting with a minor in Philosophy. Upon completion of his undergraduate degree, he furthered his education at National University earning a Bachelors of Science and a Doctorate Degree in Chiropractic. 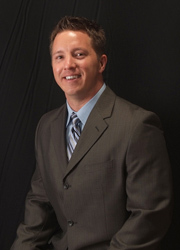 Dr. Corbin is a National Board Certified Chiropractic Physician as well as an Eagle Scout. He practiced in the Hilliard area from 2002 until 2008. He resides with his wife Trisha and his twin children Ella and Elijah (whom he has treated since their birth) in Dublin. He believes in educating not just his patients, but his community as well. Dr. Corbin has lectured on topics such as carpal tunnel, hiatal hernias, acid reflux, ear infections, asthma, allergies, headaches, stress, and athletic peak performance, just to name a few. He has done these lectures for local businesses, factories, social clubs, schools, daycares, and the general public. Dr. Corbin continues to stress the importance of Chiropractic care through the use of a natural, drug-free approach to maintaining one’s own health. He believes that there is a multitude of ways for a person to achieve better health than through medications and surgeries. Dr. Corbin continually educates himself by taking postgraduate courses and seminars to make sure he is up-to-date on the latest information for his patients and staff. Enough about us! How can we help you with today’s safe and natural chiropractic care? Give Graceland Chiropractic a call so we can help you take your first step towards better health.